Let’s get something straight, there’s a big difference between a trend and a fad. 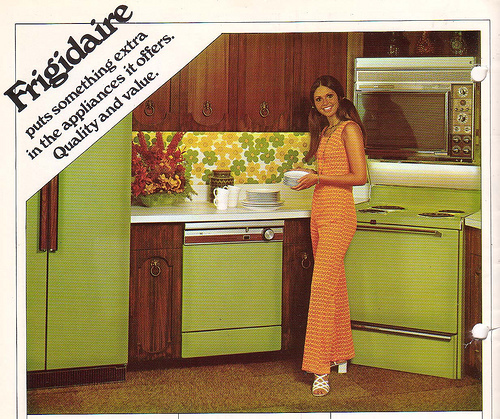 Remember the avocado green appliances of the 1960’s and 70’s? My Mother was wild about them. My family even went so far as to outfit all our apartment rentals with the most up-to-date color trends of that time, alternating between avocado green and harvest gold. Oh how we loved them. Even so, like the shag carpet, they eventually went out of fashion and were replaced with something a little more neutral: white, black and stainless. When it comes to design, I’m not a big fad follower. I tend to gravitate toward timeless styles. I do believe that trends can be enduring. There are plenty of kitchen trends that are sure to stick with us: white kitchens, farmhouse sinks, layered lighting, the accent island, and we can’t forget subway tiles (their unfading popularity is at home in virtually any kitchen). So much can be said for each of these and more, but we’ll save that for another time. For now, let me just say that we want your kitchen to be current by today’s standards and by those twenty years from now. We probably wont be recommending avocado green anytime soon. 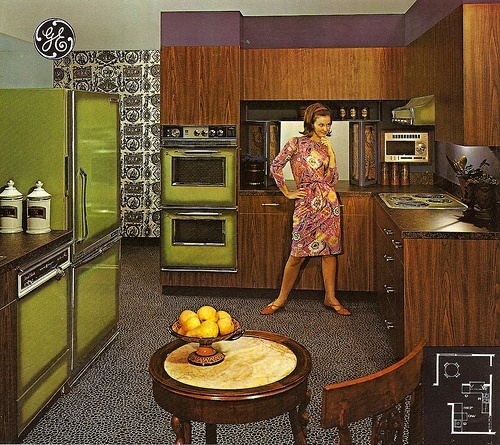 But for anyone out there whose kitchen still contains some of those 70’s-hues, good news! Color is back. Even avocado green has made something of a comeback, in a vintage-chic sort of way.